Muddy buddies or puppy chow? Whatever you call it, this cinnamon and sugar Chex mix is a great snack for the whole gang. 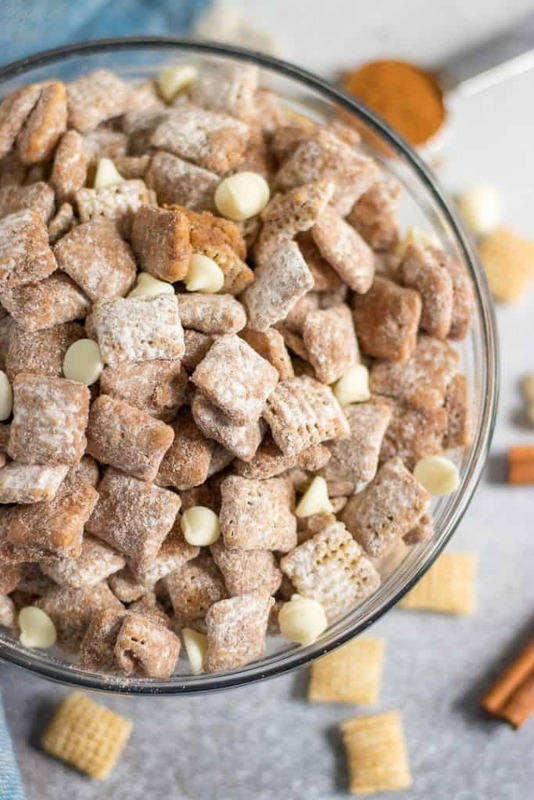 So simple, and a certain crowd pleaser, this Snickerdoodle Puppy Chow is going to be a hit! Oops. I had a post I have been working on for about a week now that I thought I would get out to you today. Will a rain check do? Monday caught up with me quickly! And so I really only have food for your belly today and not much food for thought. I am sure you will not be mad one bit though when you see what I have for you this time! I love my puppy chow, or muddy buddies, whatever you call it! So in thinking of how to up the puppy chow game, clearly some cinnamon and sugar was necessary, right?! I am working hard on this whole intuitive eating thing these days. And I am learning that treats are treats and balance is balance and moderation is moderation. Don’t worry so much if it’s not perfect. That’s the beauty–there is no such thing as perfect eating. That is quite contrary to my own way of thinking, but I am certainly a work in progress! Listen to your body! Ok, tangent complete. It was a bit of a toss up on what exactly to name this recipe. Cinnamon Roll Puppy Chow? Snickerdoodle? Regardless of the name, this snack mix is so perfect for your game day spread, a late afternoon snack or any time you have a good craving for cinnamon goodness! I tossed in some white chocolate chips to the mix and found that to be a great addition. And now it has me thinking the next time I bake snickerdoodle cookies, I better add some to those as well! At any rate, enjoy this treat. It’s a good one! 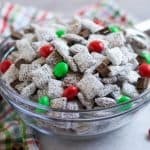 And while we are on the topic of puppy chow, it may be a little out of season but my Dark Chocolate Peppermint Puppy Chow is another super incredible treat for the whole gang–or just you, no sharing required, promise! It was my Christmas treat that kept giving last year! Pour cereal into medium bowl. In a sauce pan over medium heat, combine maple, almond butter, vanilla and 1 1/2 tsp cinnamon. Stir until warm and blended. Pour the mixture over the cereal and stir until cereal is evenly coated. Pour powdered sugar and the rest of the cinnamon into the a gallon sized plastic bag. Transfer cereal mixture into the bag and toss until evenly coated. Transfer back to a bowl and dig in! Mind = blown. Churro puppy chow?!?! This is so happening. It’s a favorite in our house! We never have leftovers! I can see these puppy chow is going to be my favourite snack 🙂 What a lovely idea and these look so tempting. Easy and fuss-free recipe. Thanks!!! One of our faves! This is such an awesome snack! The combination of flavors is amazing, especially the maple syrup and almond butter together ! Totally drooling! Well, this is absolutely genius! I am totally trying this out for Christmas! As a huge fan of snickerdoodle this will be the first thing I make next time I hit the grocery store!!! This puppy chow looks like the perfect sweet snack! And I love that you used pure maple syrup for the sweetener! WOW!!! This is 100% so my style! I love puppy chow! I was just talking to someone last night about how I love puppy chow but haven’t had it since college. 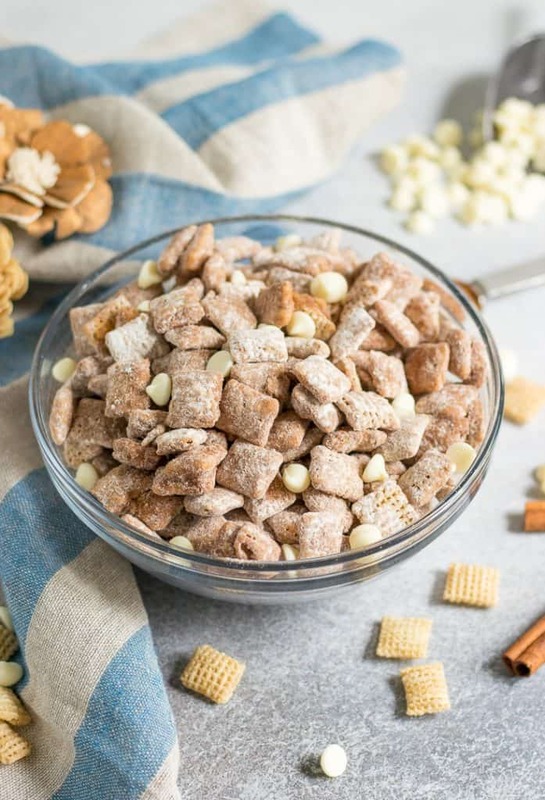 I’ve never tried snickerdoodle puppy chow, but it looks super tasty! Yasss! 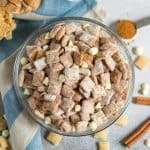 Puppy chow is a favorite of mine and I have never tried a snickerdoodle version. Sounds perfect for fall! These look so yummy and easy to make! Definitely planning to make these with my kiddos soon, they will love it!! You will win as mama with these!! Loving EVERYTHING ab out this Snickerdoodle Puppy Chow! What a fun twist on one of my favorite snacks. Perfect for game day! Game day for the win right?! Such an awesome and easy snack to make!! We need Chex in Australia! !